Click on chart below to go directly to a larger size chart. 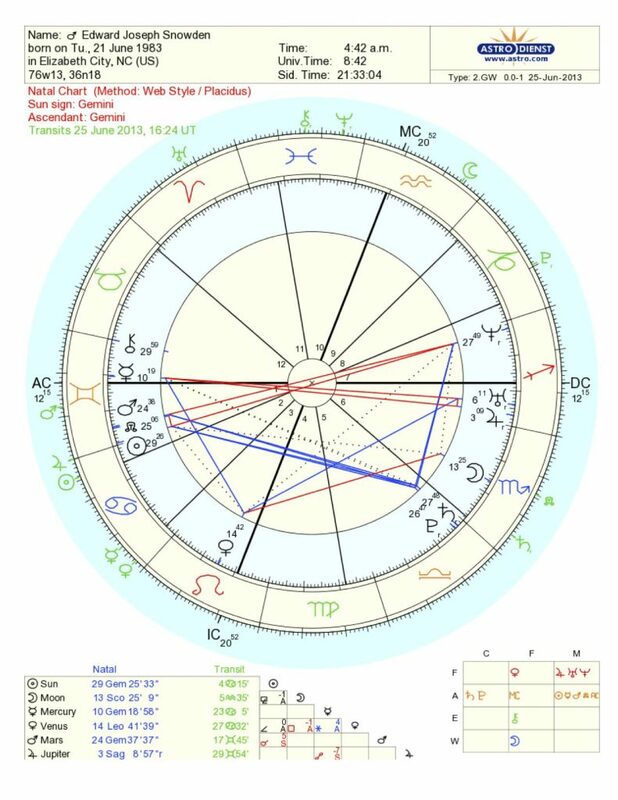 MC trine Mars-NN-Sun trine Pluto-Saturn, opp Neptune – An undercover kind of soldier. In 2013, he had a Saturn return… maturation, honesty, reality check time. On or after July 4, 2013, he’ll have a Mars return. Will be interesting to see what happens then. Jupiter is on his Sun right now – June 25, 2013… He is in the spotlight. Transiting Neptune = Mercury/Jupiter-Uranus = Sun/Moon – Some wonder if it is possible he might be a spy/ counter spy/ double- triple-agent, agent provocateur, and so on. Time will surely tell. I prefer to think he is a good citizen who got fed up with the corruption he was privy to. This story blew open around his birthday when transiting Jupiter was conjunct his natal Mars-NorthNode. He just couldn’t hold it in any longer!